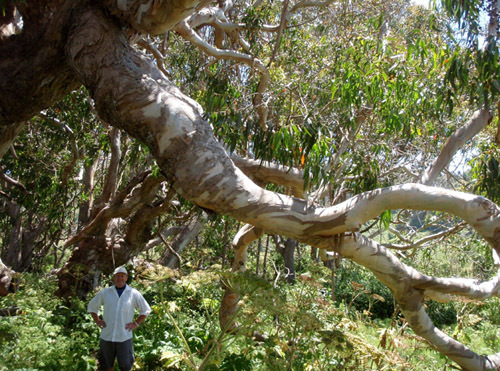 I love reconnecting with old friends, especially when it involves consulting on the fate of a large tree. 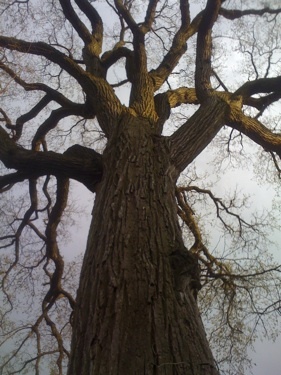 I first learned of my friend John’s elm when I posted his images and text as part of my Archive of Old Trees about four years ago. We’ve kept in touch via facebook and email since then, and have been looking for an opportunity to get together. 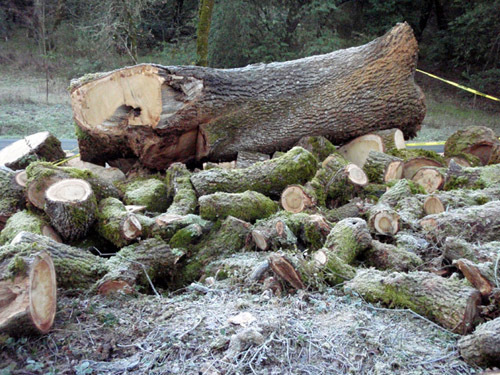 I was sad to learn of the tree’s recent demise – John posted images of large branches shearing off exposing rot – so I suggested he consider bringing the logs to a mill to make good use of the wood. John acted immediately and before I knew it I was boarding a flight to Chicago to meet with the mill guys and strategize with John about what to do with the wood. I urged John to keep the main trunk as long as possible, considering the age of the tree (about 200 years) and potential for clear, tight-grained and figured wood. 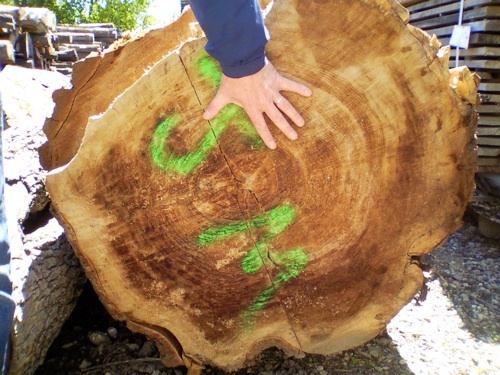 We spent an afternoon at Horigan Urban Forest Products surveying the logs, consisting of the main trunk at 14′ 6″ x 4′ diameter, and several large branches, some with interesting contours and crotches. 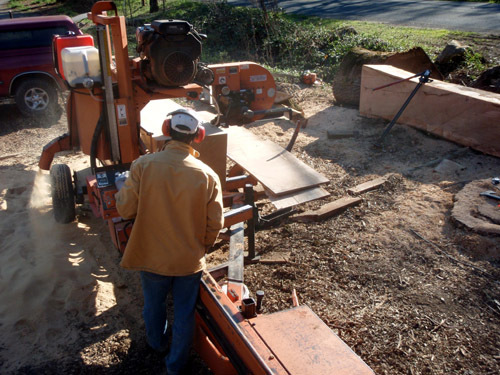 Given the limitations of the mill’s portable woodmizer and the properties of American elm, the logs obviated a cutting program that will yield about 2000 board feet of mixed width 4/4, 5/4, 6/4 and 8/4 lumber. John and I spent the remaining weekend catching up, playing music, visiting old friends and devising a project. We decided to invite a network of designers, artists and woodworkers to make things with the elm, culminating in an exhibition and/or website. 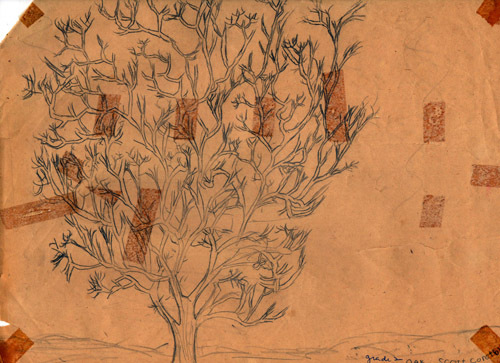 The things made will then branch out into the world like branches of a tree. 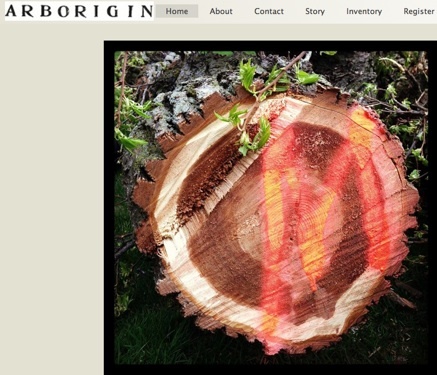 We’re calling the project Arborigin and have secured the domain name arborigin.com as a placeholder. 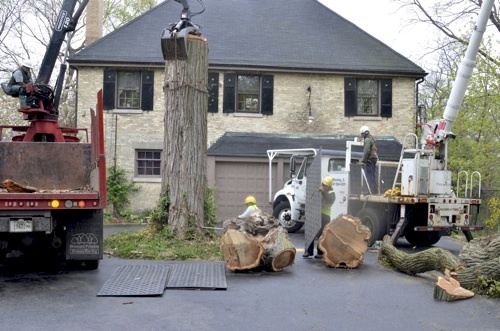 We have about three months to develope Arborigin into a feasible project while the wood cures, so stay tuned, and send a note if you’d like to be involved (scott@deepcraft.org). 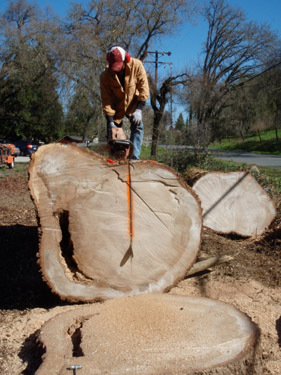 Shawn trims the ends of the felled trunk before quartering the log. 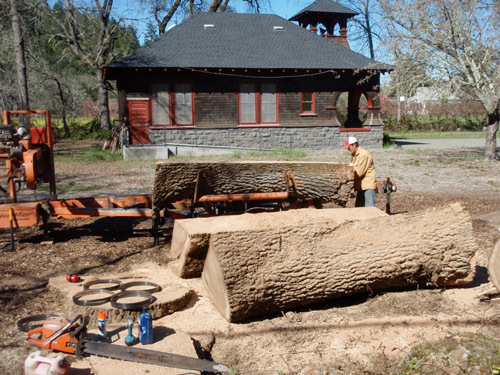 I met my friend Shawn Gavin at the old Felta School near Healdsburg the other day to mill a Valley Oak. I had purchased the log from the school after it was felled for safety concerns last September, and have been eager to see what the wood looks like. I plan to make a batch of my Deep Deck from the wood after it air dries for about a year, having successfully prototyped a small production run in American Elm. The plan is to make different versions of the deck in different woods from locally-grown, hand-milled logs, each tree telling a different story whose provenance is reflected in each series of decks. 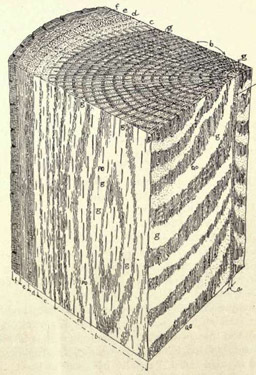 Section of an oak showing medullary rays. The Valley Oak (Quercus lobata) is a true white oak native to California’s hot interior valleys. Like its eastern cousin Quercus alba, the Valley Oak has large medullary rays that make an interesting pattern while adding strength to the wood when it is ‘quarter sawn’ from the log. The medullary rays radiate from the center of the tree to the sapwood to carry nutrients, so they run across the wood’s annular rings. 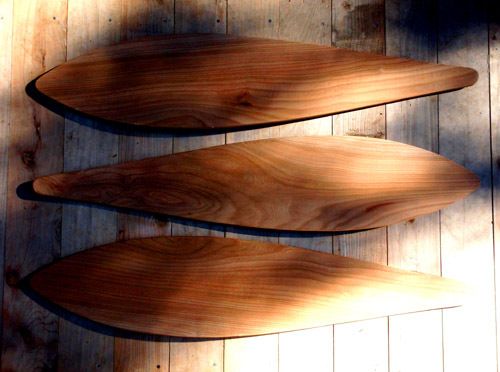 When boards are cut from the log with the annular rings perpendicular to the face, they are called ‘quarter sawn’, and the medullary rays, or ‘silver rays’ are exposed. If the milled boards are carefully stickered in stacks with good air circulation, the grain orientation and slow curing will add to the strength and stability of the wood, ideal for my innovative Deep Deck design. The ends are trimmed and sealed with wax. 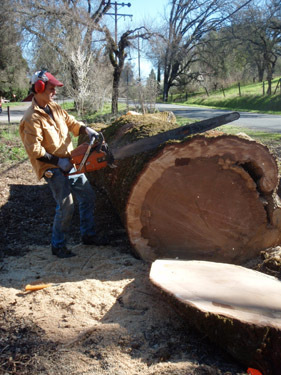 The log is cut in half lengthwise along the log’s primary ‘heart shake’. The quarters are cut perpendicular to the heart shake, along the center of the tree. 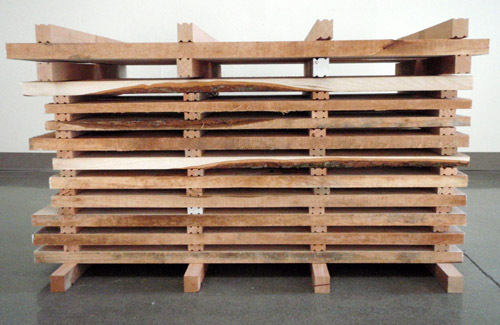 Quarters are loaded onto the mill to be squared and milled into boards cut perpendicular to the annular rings. Milling goes fast with Shawn’s expertise and hydraulic Wood-Mizer. The two of us processed a 4’d x 10’l log into about 1100 board feet of quarter-sawn lumber in just 13 hours, including loading and delivering the material to the wowhaus studio. 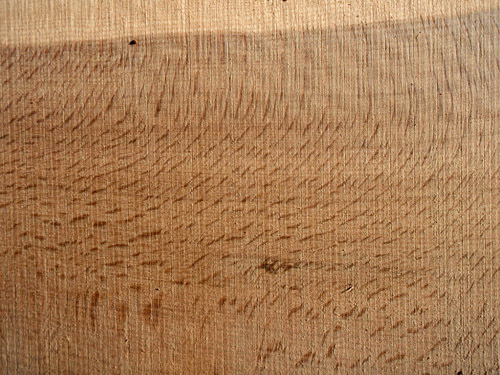 Even when rough-cut, the medullary rays are visible, so characteristic of quarter-sawn white oak. I’ve been making small batches of my Deep Deck longboard in the background of other projects in the shop, laying up a new deck each day, trimming, sanding and finishing the previous day’s cured laminations. Making decks at this scale has been a pleasant, fairly effortless task, a good way to wind down from carving the crane before I sweep up and call it a day. I burn my ‘deep’ logo onto the undersides of the decks, and stamp the species and date. In the coming year, I plan to scale up my Deep Deck production, and hope my limited production prototypes will help to generate interest. I’ll continue to make the decks by hand, but in larger batches, which should be easy once I invest in a few key tools to speed production. The decks will be offered in dated, limited editions, sequenced from locally sourced logs that I mill and dry myself; the scale of each tree will determine the scale of each production. My next batch of decks will come from a 100 year old white oak. 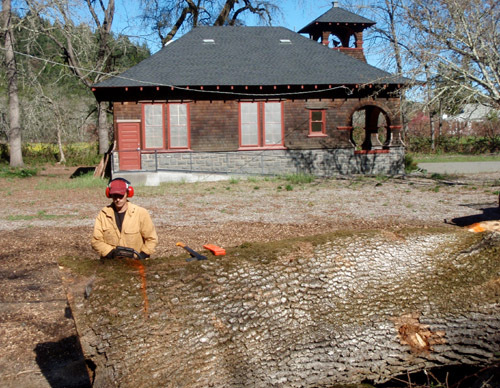 I recently purchased the log that will yield my first large production run of decks, a giant white oak that was felled for safety reasons on the property of a historic, one room schoolhouse in Healdsburg, CA. 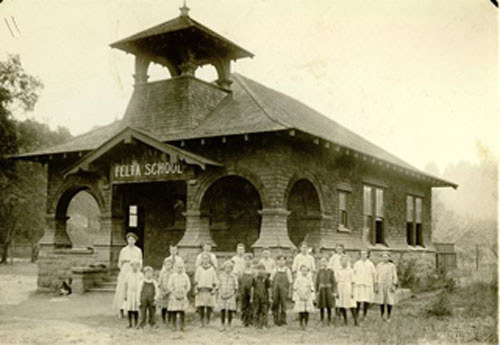 It’s likely the tree was planted adjacent to the Felta schoolhouse when it was constructed in 1906. I look forward to researching the site and posting more about its history as the wood dries after I mill it in early 2012. 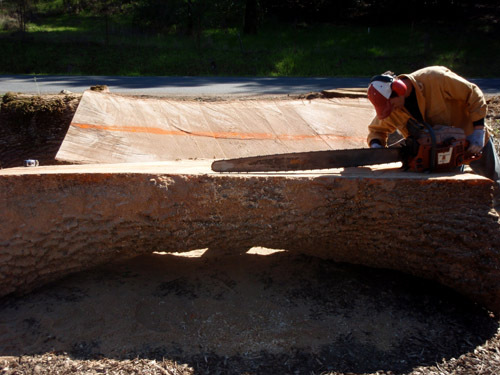 Two identical bases of green pecan, ready to receive the top, a giant slab of sycamore. Whenever I design and make a new piece of furniture, I’m always keenly aware of how it will age, and how the piece might transform over time to encourage and support future, as yet unforeseeable patterns of use. I’ve been collecting choice local woods over the years, all neatly stickered in the barn, so my design process usually begins with rummaging through my piles for inspiration, making measurements and drawing directly onto the wood with white chalk. My primary criteria at this early stage is whether the piece of furniture I have in mind is the appropriate final destination for the wood- will it do the tree justice? I’ve always thought of my furniture as a way of extending the life of a tree, as a way of simultaneously storing and appreciating wood by putting it to good use; living daily life as an extension of making. As I continue to collect and store local woods, and especially as I begin to mill trees myself, I’m becoming more attuned to the value of locally sourced, well-sawn, air-dried wood as a commodity. An increasingly scarce resource, fine wood is a good investment and increases dramatically in value, especially if it has the added cache of ecological responsibility, streaming from the urban forest, or as ‘horticultural salvage’. Because handmade furniture ultimately needs to compete in the marketplace with an increasingly sophisticated range of mass-market comparables, it can be challenging to offer a price point in proportion to the value of the material itself, which is a dilemma, even if the quality of the finished product is markedly higher. This is especially the case when ‘studio furniture’ needs first and foremost to meet rigorous functional, as well as aesthetic requirements. I milled grooves into the stickers for better air flow and to allow for movement. While my way of thinking about wood-as-commodity has lived quietly in the background of most of my furniture design to date, I’ve been wanting do make a new body of work where the concept is front and center, both in the process of making and in the process of using the furniture. To this end, I’m grateful to my friend Cindy Daniel, who commissioned a ‘Demonstration Table’ for Shed, her Healdsburg-based café/retail/community hub offering local foods, goods and quality wares. Shed is Cindy’s contemporary spin on the traditional country mercantile store, and I’ve enjoyed working with her over the past two years designing interior scenarios for the new building currently under construction, a large, open air metal structure designed by Mark Jensen. As much as my Demonstration Table for Shed will serve as a gathering place in the café, it doubles as a process piece for the duration of the enterprise, establishing a kind of invented tradition. The table’s base consists of two nearly identical stacks of green pecan wood I recently milled from a dying tree, neatly stickered to allow the wood to naturally air-dry. 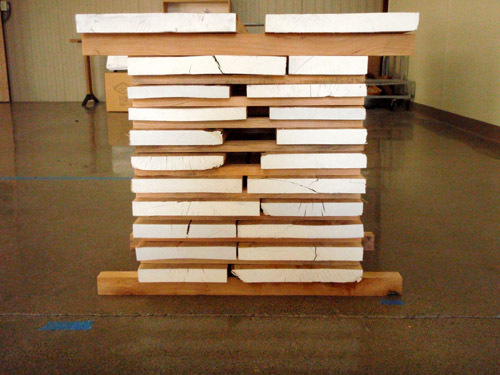 The table’s top, a massive slab of sycamore, rests on top of the two piles, acting as a gravity clamp to keep the material from cupping. I milled V-grooves into the stickers to allow for better air flow and to decrease friction as the boards inevitably shrink. After one year, when the stock is adequately dry, the top will be lifted and the material removed and converted into functional wares for Shed, either to be used in the café or sold as product to customers. This first batch will likely make small table tops for the Shed café, slated to open in October 2012.. 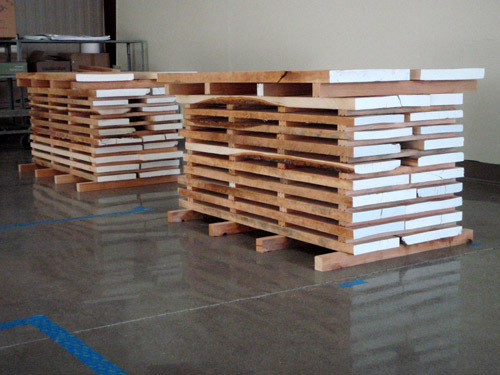 The two bases will then be re-constructed, stacked from freshly milled wood each year, that will in turn be made into a small production run of whatever item surfaces in the course of its drying. I typically shellac and wax the ends of boards to prevent undo checking. I like the idea of adding an element of ‘crowd-sourcing’ to the design development of an annual product, taking advantage of a constant flow of people gathered around the table while the material slowly cures beneath. I also look forward to maintaining an ongoing relationship with Shed as a kind of artisan-in-residence, collaborating with Cindy to design products that exemplify the Shed ethos. Please click here to see the table with the top installed. My fascination with trees and wood dates from early childhood, when I would spend hours staring at trees in different seasons and trying to draw them as accurately as I was able, carefully mapping every branch, leaf or blossom. I remember getting lost in the process, losing track of the actual tree in front of me and having to make up branching patterns, overwhelmed at the endless variety of mature, deciduous trees like white oak. I remember thinking how my decisions to make new branches looked a lot like the tree’s ‘decisions’, which got me thinking about whether or not trees had consciousness. I’m still not sure about this, but try my best to think about the shape of the tree when working with its wood, making decisions with which I know the tree would agree. I’ve made just two visits to my recently completed House of Tree project and it already feels as though it’s always been there, or at least was always meant to be there. Climbing the 30 steps to the cabin, you wind around the inside of the tower, first facing South, then West, then North, entering onto the back porch after a final ascent to the East. The number of stairs of each climb is roughly in proportion to the scale of the landings they lead to, both increase in number and size, respectively, as you go up. It’s as though if you kept climbing you could reach the vast open sky, kind of how I always pictured happening in Jack and the Beanstalk. Indeed, entering the structure after winding up the tower has a magical effect; the height off the ground adds to the feeling and it’s easy to drop the cares of the world below once inside. 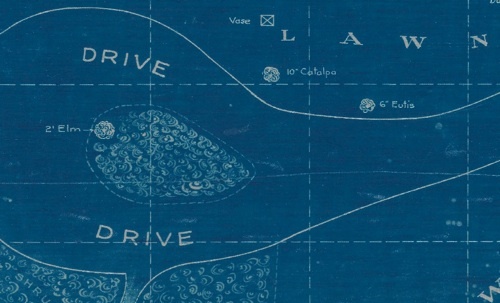 What makes treehouses of all kinds so universally lovable is that they are all essentially hermitages, places where we go to get away, or to reconnect in some way, usually beginning simply with the dream of being in a tree or of feeling protected in the forest. I designed House of Tree in collaboration with my client, who wanted a secret place to escape to. 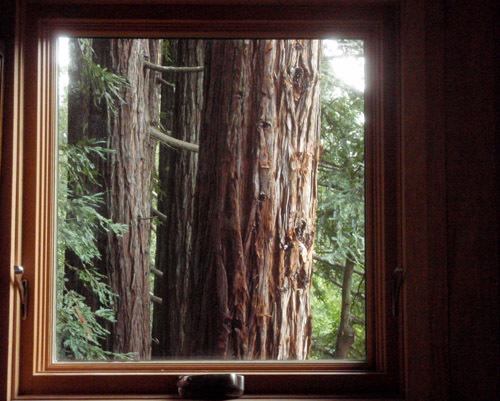 Its windows frame views of the redwood forest on three sides, with the Western elevation opening out to an apple orchard in a clearing to catch the afternoon sun. Though the cabin is just over 200 square feet, it’s easy to imagine spending a few days with spare provisions, without ever wanting or needing to touch ground. 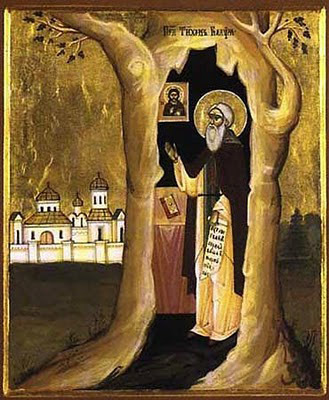 One of the more legendary tree-dwellers is Saint Tikhon of Kaluga, a 15th century Russian monk who lived in a hollow oak tree on the banks of the River Vepreika. A famous monastery and cathedral were eventually built on or near the site of his original hermitage, and a Feast Day is celebrated in his honor on June 16, the date of his death in 1492. 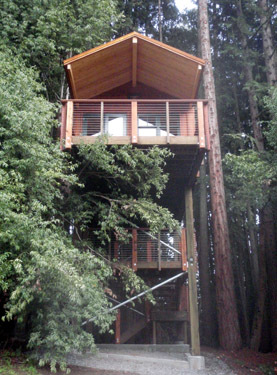 I would love to see this date marked as a treehouse holiday in celebration of arboreal living.